Eight RHS seniors presented in last night’s annual Spellman Oratorical Contest competing for the $4,000 in prize money. This annual event was hosted by the English Department Director, Caroll Cahill and was held in the RMS/RHS Lecture Hall. The theme of last night’s competition was The Art of Darkness: Evil, Pain and Enlightenment. The speech contest begins with a written essay in senior AP Literature and Composition class led by Chris Neal. The assignment’s objective is for students to use past and present literature and art to develop their thesis. Each of Neal’s 18 students were required to submit a 500-1,000 word essay pertaining to the theme. From there, eight students were selected to participate in the oratorical portion of the contest. Here, three outside judges, Karen Bonn, Amelia Füss, and Laura Whittaker, evaluated the speeches for content, delivery, poise and diction. In the end, the results were as follows: First place: Aiden Glennon, $1200; Second place, Erin Field $1000; third place, Sean Sugrue, $700; fourth place, Sean Fitzgerald, $500; fifth place, Stephanie Blaney $300; Kellie Berry, Brianna Ferraro and Saoirse McNally placed 6th, 7th and 8th, each winning $100. Here is a link to the video of last night’s competition. 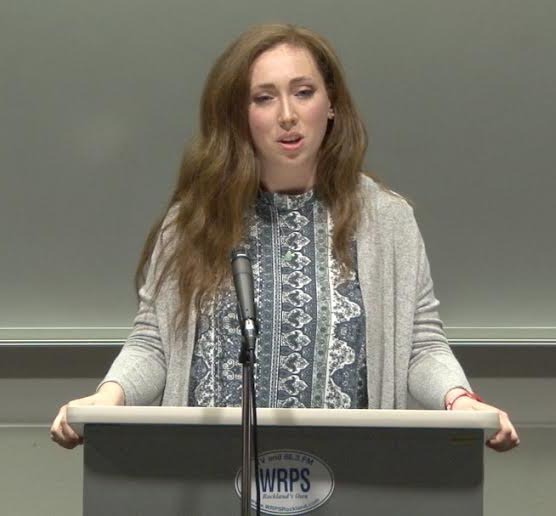 Below is the video of the Spellman Oratorical Contest. Eight seniors competed for $4,000 in scholarship money donated annually from the trust of Ellen Conway Spellman for high school seniors. This year Aiden Glennon came in first with Erin Field placing second. Also competing were Brianna Ferraro, Kellie Berry, Sean Fitzgerald, Sean Sugrue, Soirse McNally and Stephanie Blaney. 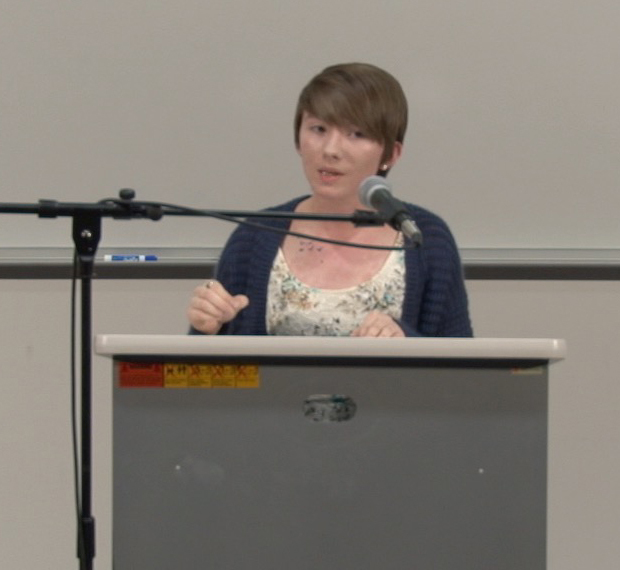 The annual Spellman Oratorical was held in the lecture hall on Wednesday, April 5 . At its roots this is a speech competition open to only seniors, where they were required to write a 500 to 1000 word speech, with the prompt changing each year. This year’s prompt was all about the question, not the answer. Students had to explain how a variety of works of art were created in order to provide the audience with a better understanding of how to successfully question themselves and the world. Students who were interested presented their speech to English teacher Christopher Neal. After about twenty students presented t him, he narrowed it down to eight finalists to present their speech in the official event. Those who spoke Wednesday night were , Michael Belmonte, Emily Delaney, Jurnee Dunn, Luana Lima, Jessica Lutts, Sophie McLellan, Evan Murphy, and Lauren Zaremba. The prize, besides bragging rights, involved money: first place would get $1000, second place $700, third place $500, fourth place $300, fifth place $200, and sixth, seventh, and eighth place would receive $100 each; no one would leave empty handed. The awards’ total was $3000. Prize money was awarded from a trust established by the late Francis Cardinal Spellman of Whitman in memory of his mother, Ellen Conway Spellman. The panel of judges included Laura Whitaker, Karen Bonn, Peter Woodward. Whitaker is a grade 7 ELA teacher in Stoughton where she has worked since 2003. She received her Master of Arts in Teaching English from Bridgewater State University.Bonn is a former RHS Bulldog. During her time at RHS she was active in drama, chorus and the debate team. Following high school, she attended Dartmouth College and Suffolk University Law School. She is proficient in American Sign Language and French. Woodward is the former RHS English Dept. Head. Following his retirement from RHS, Peter went on to teach in China for three years and he continues to teach English part time at Hanover High School. First place went to Murphy, second place went to Dunn, third place went to Lutts, fourth place went to McLellan; fifth place went to Delaney, and the final three places, in no particular order, went to Belmonte, Lima, and Zaremba. Seniors await judges’ decision after their speeches at the Spellman Oratorical Contest on Tuesday, April 12. 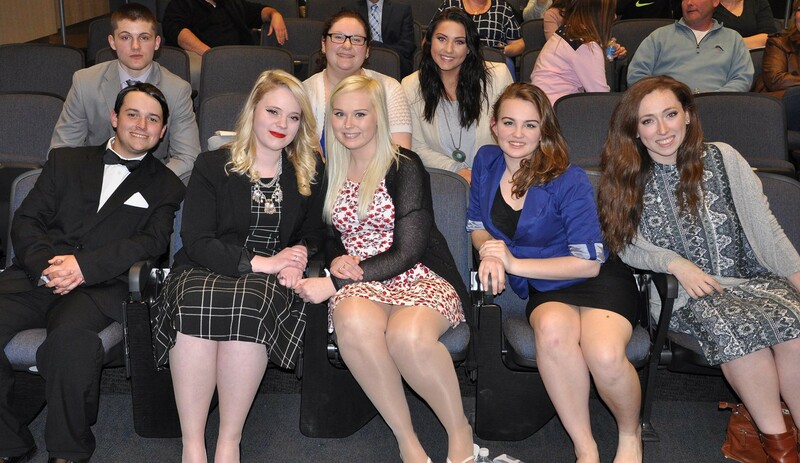 Front row l to r: Mark Ewell, Haley Macray, Meghan Foster, Leah DeCecco and Ashley Pezzella. Back l to r: Brad Gasdia, Celia Rosa and Bella Rindone. Veritas Photo. The annual Spellman Oratorical Contest occurred on Tuesday, April 12 at Rockland High School. This contest was created in memory of the late Ellen Conway Spellman of Whitman. This year’s topic was “Nonconformity, Society, and the Human Condition” as seen in art or literature. 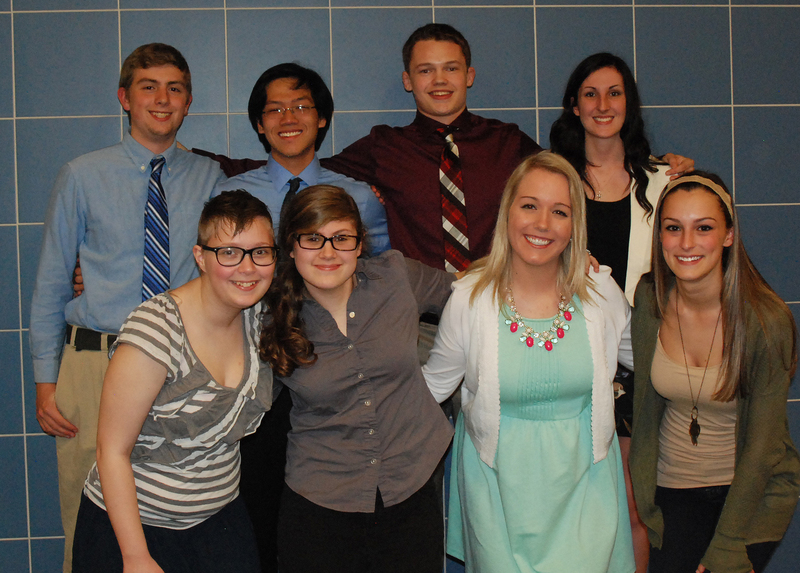 The essays written by all seniors were narrowed down by AP English teacher, Mr. Neal, to the top eight contestants. The winners were chosen by three impartial judges, Laura Whittaker, Kevin Whitaker, and Bill Cunningham. Contestants were judged based on content, delivery, diction, and poise. 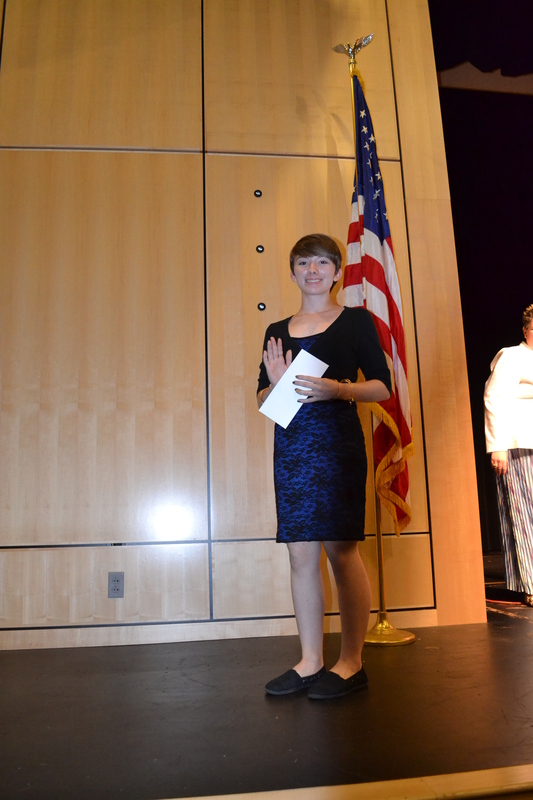 Ashley Pezzella was awarded first place at the Spellman Oratorical Contest on Tuesday night. WRPS photo. Ashley Pezzella won first place with a prize of $1200 in college scholarship money. Mark Ewell took second place and the $1000 scholarship. Leah DeCecco came in third place and received a $700 scholarship. In fourth place was Bella Rindone who received a $500 scholarship. Brad Gasdia came in fifth place and received a $300 scholarship. Meghan Foster, Haley Macray and Celia Rosa tied for 6th place and each received $100 scholarships. Danielle Hill (Class of 2015) was the winner of the Spellman Oratorical Contest last year. In order to participate in the contest, RHS seniors submit a written essay on the specified topic and the top eight are then chosen to compete in the oratorical portion of the contest. Judging will be based on delivery, content, diction, and poise. The contest is open to the public and admission is free. 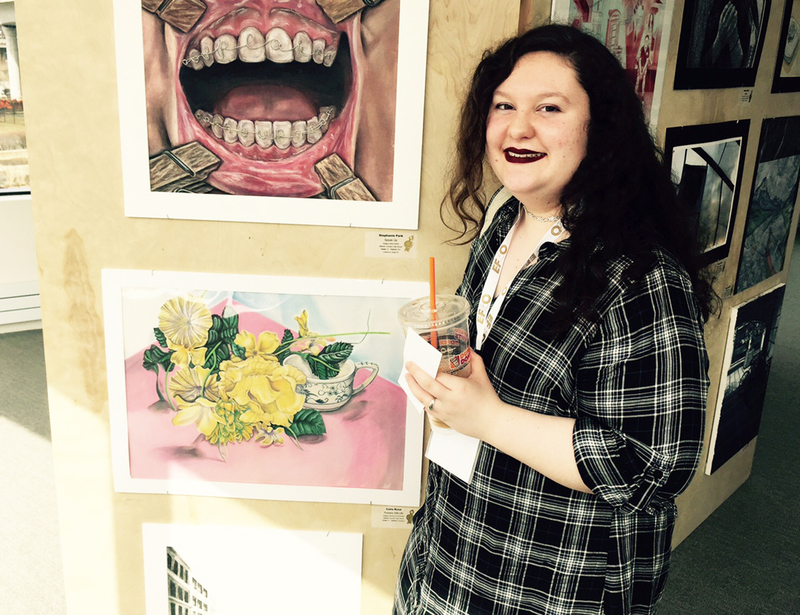 Celia Rosa with her award winning still life on display at the Globe Show. Art work from all the schools will be on display at the RPS Arts Festival on Thursday, April 14 from 6 to 9 p.m. The Spellman Oratorical is traditionally held during the same week as the Rockland Public Schools’ annual Arts Festival. The Arts Festival is on Thursday, April 14 this year in the high school gymnasium. The gym will be open from 6 p.m. to 9 p.m. and artwork from all grade levels in the Rockland Public Schools will be on display. Also, the Consumer Science, Tech Ed and Robotics classes will have their creations on display. Photos from last year’s Arts Festival can be seen here. 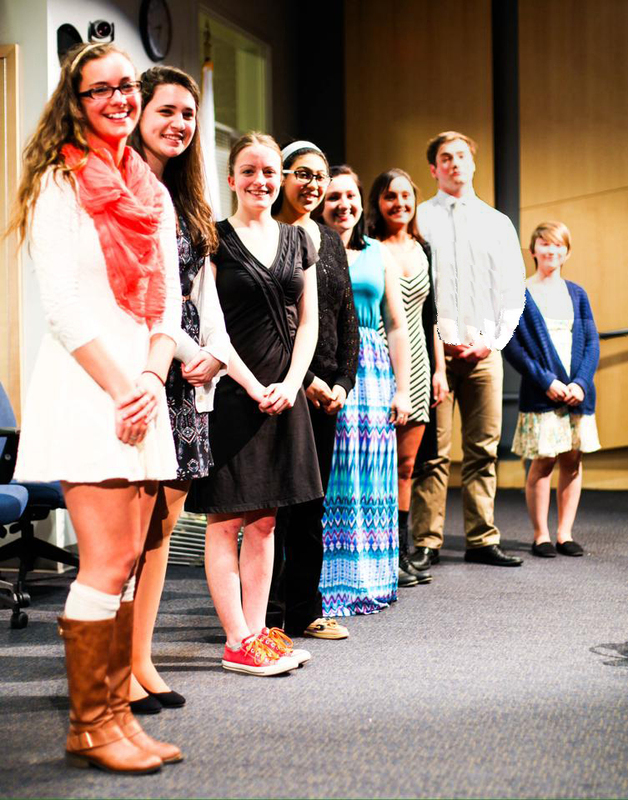 The annual Rockland High School Spellman Oratorical Contest was held on Tuesday, April 14 in the lecture hall. Eight students wrote and presented orations based on the theme Heroes Remembered: Heroism’s Portrayal in Art and Literature. 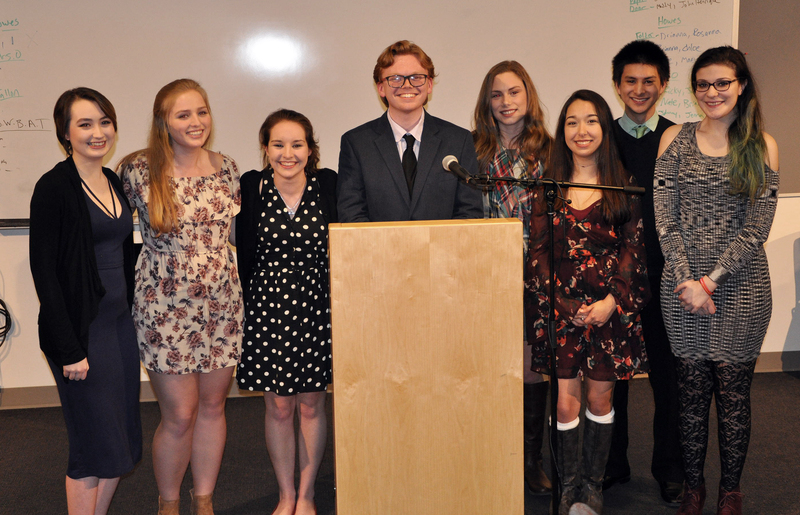 The 2015 Spellman Oratorical Contest presenters from left to right: Katie DeLorey, Alyssa Collins, Ella Engle, Iman Bendarkawi, Emma McGarry, Alex Pigeon, Pearse McNally, and Dani Hill. After essays were submitted, the authors of the eight best were chosen to participate in the event. The eight seniors competed for $4000 in prize money. Prize money was awarded from a trust established by the late Francis Cardinal Spellman of Whitman in memory of his mother, Ellen Conway Spellman. There are three judges who base their choices on delivery, content, diction, and poise. Winners of the contest were Danielle Hill who took first place honors and $1200; Pearse McNally who came in second, winning $1000; third place went to Alexandra Pigeon who won $700; Emma McGarry came in fourth winning $500; Iman Bendarkawi was fifth and won $300; and Katie Delorey, Alyssa Collins, and Ella Egles placed 6th, 7th and 8th, each winning $100. Congratulations to these students! The annual Spellman Oratorical Contest will be held tonight at 7 pm in the Lecture Hall. Eight students will present original speeches commenting on this year’s topic Heroes Remembered: Heroism’s Portrayal in Art and Literature. The awards for 2015 will total at least $4,000 in scholarship money. Judging will be based on delivery, content, dictation, and poise. To read about last year’s competition please click here.